ATTN: All Past Wedding Clients! Want to Win a Free 8×10 Wedding Album?? If I photographed your wedding (not just this past year, but ever! 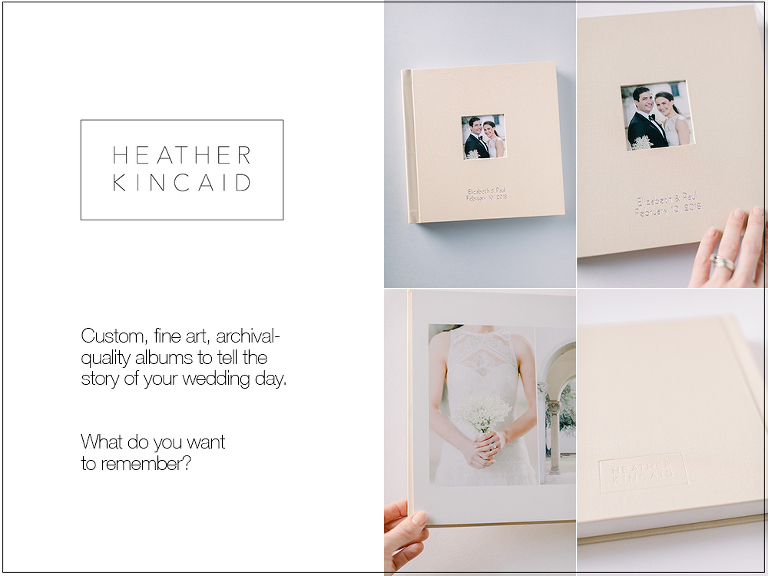 ), I have a really fun giveaway for you where you could win a FREE 8×10 Wedding Album! I’m asking all my past wedding clients to share a favorite image from your wedding in your Instagram feed and in the caption write a little client testimonial about your experience working with me on your wedding day. This contest is open to MY PAST WEDDING CLIENTS ONLY. But, don’t worry, I will be holding other contests soon for portrait session clients! Post a favorite image (or images!) that I took at your wedding to your Instagram feed. Posting to Stories is a nice bonus, but only images posted to your main feed will be entered. Tag @heatherkincaidphoto in the caption and use the hashtag #heatherkincaidclient to be sure I see your post! Write a short client testimonial in the caption about what it was like to work with me. While posting images I’ve shot and tagging me is always SO appreciated, clients who do this by 10am PST on Friday, February 8, 2019 will be entered into a random drawing to win a free 8×10 wedding album (30 pages and up to 80 images of your choice)!! Winner will receive an 8×10 flushmount album that includes 26 pages and up to 70 images shot by Heather Kincaid of your choice! Albums can only be designed with images shot by Heather Kincaid Photographer and this credit must be used no later than April 30th, 2019 otherwise all prizes are forfeited. Prize is not redeemable for cash credit nor is it transferrable to any other product or service. If you never got around to ordering your wedding album, or if you want to order an extra for your parents, or just to have, this is such a great opportunity! You can also use the album credit for a portrait session or other event I have photographed for you if you prefer! I can’t wait to see you share your favorite images from your big day! And good luck to all who enter!